Alighted on a wall below a porch light, Phoenix, Maricopa Co., Arizona. 16 Jan. 2017. Wing span is about 20 mm. 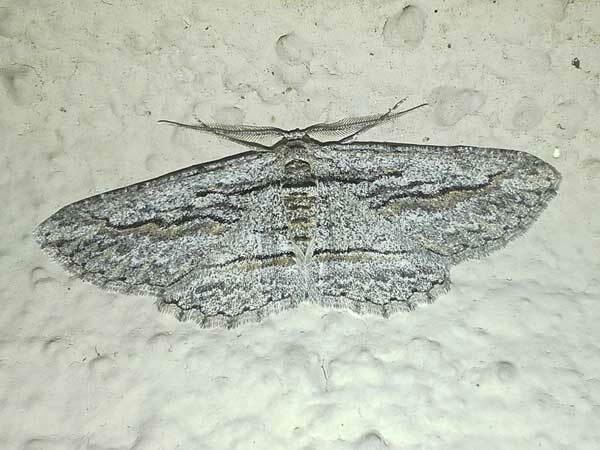 This little moth showed up at my porch light in Phoenix in January. The larvae (caterpillars) feed on leaves of various trees and shrubs belonging to the Mimosoideae subfamily of the Bean Family (Fabaceae). Because this winter season has been very mild many of these related plants in the Phoenix area have fresh new growth, the kind the loopers prefer. The larvae are called loopers because of the looping manner of locomotion. Copyright Michael J. Plagens, page created 16 Jan. 2017.